Gateway to Petra: Queen Alia International Airport, Amman, Jordan. Petra is Jordan’s greatest tourist attraction. Carved into sheer rock more than 2,000 years ago by the Nabataeans, the city was an important junction on the silk and spice trade routes that linked China, India and Arabia with Greece and Rome. In 2007, Petra was elected as one of the New7Wonders of the World and the opening last year of the spectacular new passenger terminal at Queen Alia International Airport means that record numbers of sightseers will be making the 245 km trip from Amman to Petra. 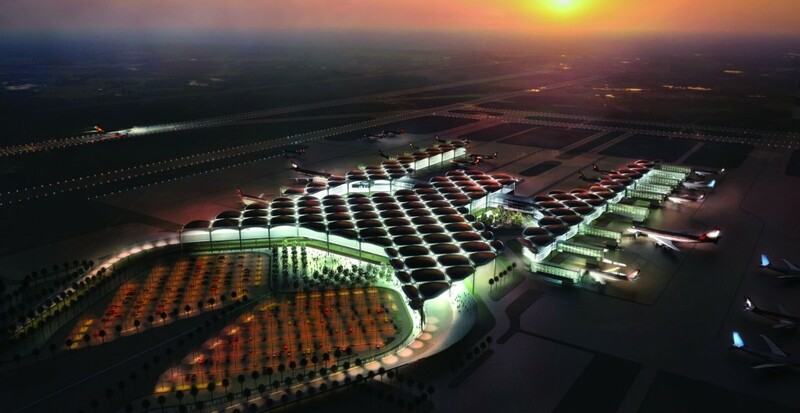 The airport capacity is projected to grow six percent annually, increasing from 3.5 million to 12 million passengers a year by 2030. The Incan settlement of Machu Picchu was also elected one of the New7Wonders of the World in 2007 and Peru’s private investment promotion agency ProInversion recently announced the awarding of the contract for the construction the new international airport of Chinchero–Cusco, which is expected to be a hub for Machu Picchu visitors, especially from Argentina, Ecuador and Chile. The election of the Puerto Princesa Underground River as one of the New7Wonders of Nature in 2011 put the Philippines on the global stage as an eco-tourism destination and the planned Puerto Princesa Airport, which is expected to be operation in early 2017, will have an annual capacity of two million passengers. Ha Long Bay was also elected as one of the New7Wonders of Nature and the Vietnamese Ministry of Transport has just approved the construction of the new Quang Ninh Airport. It is expected to handle six million passengers a year and would streamline flows of visitors to Ha Long Bay.